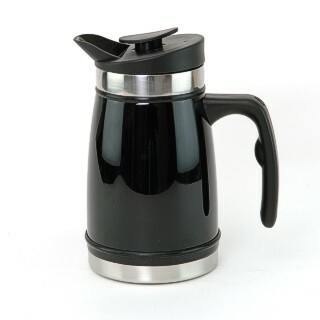 This highly functional French coffee press with its curvy sides has a broad non-slip rubber base for added stability. It has a wide and easy to pour spout and a pistol grip handle that fits in the hand comfortably. It can be used in the home, office and with its non-slip rubber base and low centre of gravity it would be extremely useful in a boating environment. This cafetiere has a 0.6 litre capacity (just over one pint) and is made from double skinned marine grade 18/8 stainless steel for thermal insulation, with a robust enamel coating. Available in five attractive colours, ice blue, pink, lichen, red and black, as well as brushed metallic chrome.